Flooding slowly subsided in parts of Oklahoma and Kansas, but forecasters said an approaching storm system could hamper efforts to clean up after weeks of heavy rain damaged homes, businesses and roads. "Unfortunately, more downpours are likely today, and it's not just in one area, as this rain is falling over a large part of Texas," says CBS News meteorologist George Cullen. The biggest concern was at Lake Texoma along the Oklahoma-Texas border, where water was projected to spill over the Denison Dam on Thursday, said Bryan County Emergency Management Director James Dalton. "(We're) warning residents along the Red River to move all livestock, equipment and other necessary belongings to higher ground," Dalton said. "We are also urging residents to have an initial evacuation plan, should conditions threaten homes in the area." Severe thunderstorms formed along a cold front as it sagged southward out of Kansas and Missouri toward Oklahoma on Wednesday. Heavy rain also fell in Texas. Floodwaters were ebbing in several northeastern Oklahoma communities, but meteorologists predicted more problems because lakes and reservoirs were already filled to capacity. 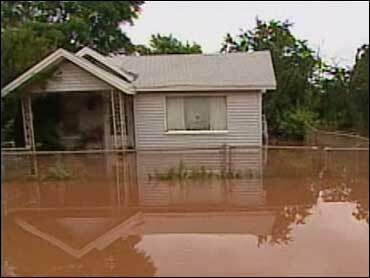 The worst flood damage was in Miami, where the Neosho River crested at about 29 feet, its highest stage since 1951, before beginning its decline. "We're starting to see an average drop of about a half-inch every hour," City Manager Mike Spurgeon said. U.S. Rep. Dan Boren took an aerial tour to assess the damage with representatives from the U.S. Small Business Administration, the Federal Emergency Management Agency and the Oklahoma Department of Emergency Management. Boren, D-Okla., promised to do whatever he could to secure federal assistance for the victims. About 50 Oklahoma Army National Guard troops worked 12-hour shifts providing security in flood-ravaged neighborhoods. In Texas, locally heavy rain spread across wide areas of the state on Wednesday, causing minor street flooding. "We have a put a lot of work into it, to make it livable and now we don't have anything," Wichita Falls, Texas, resident Veronica Gallegos told CBS News. A total of 148 of the state's 254 counties were under flash flood watches, flash flood warnings, flood warnings or a combination of watches and warnings Wednesday night. The Trinity River in the Dallas-Fort Worth area was expected to crest at 37 feet during the night, about 7 feet above flood stage. Corpus Christi recorded nearly 3½ inches of rain by Wednesday evening on top of 10 inches that fell on Monday. The weather has been blamed for 11 deaths in Texas in the past two weeks. South of Houston, the search was continuing for a 6-year-old boy swept by high river waters into the Gulf of Mexico, reports CBS News correspondent Hari Sreenavasan. At least 1,000 people were out of their homes throughout southeast Kansas, said Sharon Watson, spokeswoman for the Kansas adjutant general. In northeastern Oklahoma, the Caney River began slowly falling after cresting at 34.18 feet, according to the National Weather Service. The river, which forced hundreds of residents near Bartlesville from their homes this week, wasn't expected to fall below flood stage until Sunday night, the weather service said. Meanwhile, a 42,000-gallon crude oil slick that spilled into the Verdigris River during a flash flood in Coffeyville, Kan., had mostly dissipated, and there was no indication the oil went into Oklahoma's Lake Oologah, a water source for Tulsa, officials said Wednesday. Coffeyville Resources said oil had stopped leaking from the refinery. Officials were trying to determined what caused the spill and were assessing damage to the plant.